Getting the humidity out of your cabin! 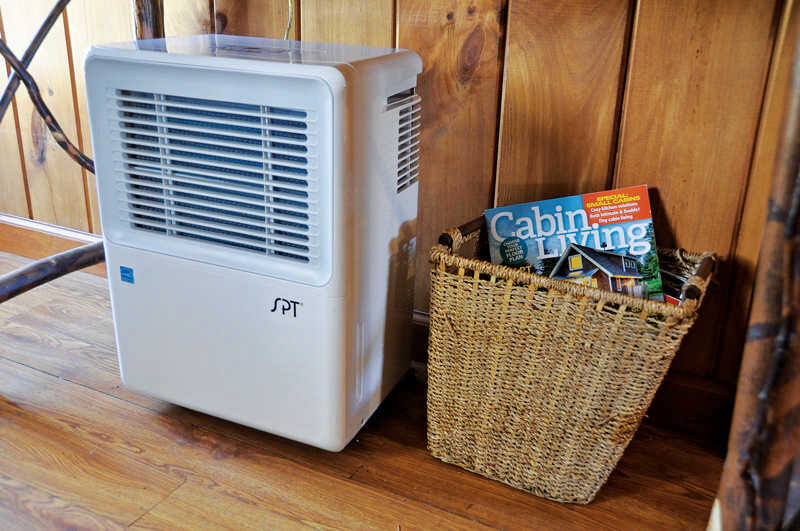 A larger compressor-style dehumidifier works better and more efficiently when you need to eliminate moisture from larger rooms and whole cabins. After a wet spring last June, my wife and I started noticing mildew in remote corners and in at least one kitchen drawer of our cabin. Having dealt with mold and mildew in a previous cabin and aboard various boats, we knew to address the problem immediately. The situation called for a way to dehumidify the air in our log abode, which has limited air circulation because we only use the seasonal cabin on weekends. The balance of the time, it’s buttoned-up pretty tight. We crack windows at the peak of the roof for air flow, but that’s about all our situation allows security-wise, and humidity can build up during the summer months in the dwelling. We were in the market for a way to lower the humidity in our absence, and our research revealed two types of dehumidifiers from which to choose: compressor-based and desiccant units. Disposable “moisture eliminators” are good for small spaces, like drawers and undercounter areas and inside boat cabins and lockers, but compared to other types, they aren’t effective enough for large spaces. Rechargeable desiccant dehumidifiers are a step up from the disposable styles, but still aren’t very effective in any space larger than a closet. Full-size desiccant dehumidifiers are the only types comparable to a compressor-based dehumidifier. They feature a rotating desiccant drum and blowers that draw air through the unit. However, even the full-size desiccant models usually remove less moisture per day than comparable compressor-based dehumidifiers. A compressor-style dehumidifier operates on the same principle as an air-conditioning unit: warm air is pulled onto metal plates, called evaporator coils, that are cooled by a chemical refrigerant running through them. The moist warm air cools, and the water condenses onto the evaporator coils, then drips down into the dehumidifier’s collection tank or drainage port. Compressor dehumidifiers are classified according to how many pints of moisture the dehumidifier is rated by the manufacturer to be able to remove per day, typically 70, 50 and 30. Larger units draw more power per unit time but are using that max power for a much shorter period of time than smaller capacity units’ compressors to remove the same amount of moisture. The reliability and durability of the larger dehumidifier is going to be significantly better than for a smaller capacity unit in most situations. Use disposable moisture-eliminators for small spaces like under-sink cabinets, bathrooms, and boat lockers. 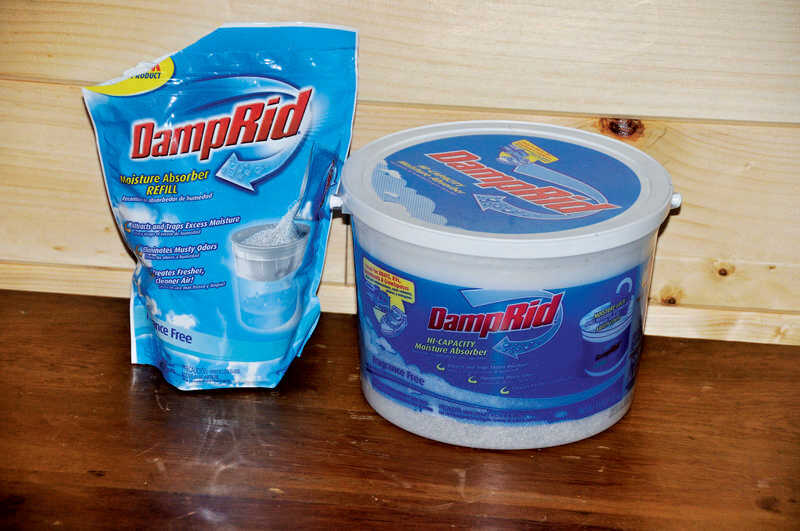 The moisture removed from the air collects in a bucket that fits into the bottom of the dehumidifier’s cabinet, which is equipped with a float switch that automatically shuts off the dehumidifier when the bucket is full. In our case, we aren’t around to empty this bucket when it fills, so we required a feature found on most – but not all – dehumidifiers: a gravity drainage port. The outlet port is threaded to accept a garden hose or an included hose to drain the dehumidifier using gravity to take the moisture wherever the hose is directed – as long as the end of the hose is lower than the drain port. If you must drain to a location that is higher than the port, you’ll need a dehumidifier model equipped with a drain pump, an option available on many higher-end dehumidifiers, and after-market pumps are available for use with units that don’t have a built-in pump. If you plan on using a compressor dehumidifier in an area where the temperature drops below 55°, you should consider units that offer a defrost mode to keep the coils from freezing up. Desiccant dehumidifiers might make a better choice, as they can remove moisture in air temperatures well below freezing.